Has it really been 6 years since Shields last grasped this golden lady as a member of the Tampa Bay Rays. It seems like oh so long ago that Shields and one of his team again ventured into the Fall Classic. But this is one of the reasons Shields plays this game. To be a part of the team that elevates their game to the highest level of style and play to showcase their young and veteran talents on the World Series stage. Sure this time around Shields might have a few more miles on his arm, but with his added bonus of being on this stage before, he can inspire and show some of his younger teammates how to harness the energy and bottle it up for game time. For a long time some within the Rays Republic knew Shields would get back to the World Series and were truly stunned when the Rays traded him and RP Wade Davis to their small market brethren. Some have even wondered recently which team got the better end of that deal, and at this moment if you ask anyone….You might imagine the scale is tipped in the Royals favor. How ironic was it that the main player in that Rays and Royals deal was one of the first people to take to Twitter and show his enthusiasm and joy for the Royals team that drafted him not so long ago. I am so happy for Shields. He is one of the former Rays players I hoped would again grace the biggest stage in baseball. I wanted see “Big Game” again get a chance at collecting another bit of baseball immortality by winning a World Series. I know his 2008 Tampa Bay Rays teammate Jonny Gomes got his piece of bling first, but you know Shields will cherish it, caress it, possibly design some sort of epic new fashion statement around it. (I’m wearing his 1st Rays T-shirt creation as I write this post). 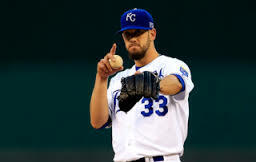 Seriously, how awesome is it that Big Game James get to once again toe the rubber in Game 1 of a World Series and possibly set an early tone in who could possibly be the last team standing in 2014. I can see it now with my 162 stitch crystal baseball as Royals ace Big Game James taking the hill on 3 days rest in Game 7, all tied at 3, winner takes all. 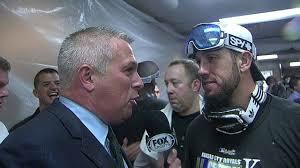 And you know who I want to win….and thrust skyward the World Series MVP Trophy. Now it’s up to Shields and the Royals to finish the season on a grand scale on a year that can never be tarnished. Leave it to the Tampa Bay Rays to make me look like a fibber. For some reason I was given the end-around, double clutch fake woohoo babied about the Rays Post season ticket packages. This is not the first time the Rays have tried to swerve my judgment or even taken me down the path least followed, but this time I thought the source was secure. So it was a total surprise today that I got a treasured packet within my mailbox today from 100 Tropicana Drive. And when I opened it, I swear a heard a chorus of rowdy angels singing off in the distance. For today was the day I was to hold within my sweating fingers the first acknowledgment by the Rays that we might wander into the Playoff territory again in 2010. So it was no wonder that I quickly tore that white envelope’s end off and gathered in the dark blue folder with Rays icons Jeff Niemann. Matt Garza David Price and James Shields on its cover. I find ot kind of ironic that the four pitchers posed on this folder’s cover might just be the Rays starting four in the postseason. But what was more remarkable was the inserted invoice for the Postseason in my little seat in Section 138 was going to cost me $950 little George Washington’s with a $ 25 Service Fee…..Really a service fee that high? In the end, getting a seat not even 7 feet from the playing surface for less than $ 1,000 is extremely rare, and one of my cherished possessions in life. And I like how being a Rays Season Ticket holder has gotten me almost a 20 percent discount for the ALDS and ALCS game, but no such luck getting a discount for the MLB-controlled World Series tickets. But still, it is pretty cool that the possible 10 games (plus 2 possible tie-breaker games) the Rays could play in the 2010 post season will once again be mine and all mine for its entirety. And again we have been given the double fingers crossed promise by the Rays of additional seats in the 300 sections of the stadium with the number of seats granted equaling our normal Season Ticket seats. For me, that would be one additional seat for $ 590. But as in 2008, the deadline for my little George Washington’s to wander into the Rays money safe is by the deadline of Wednesday, September 8th, which is less than 19 calendar days from today. Why couldn’t the Rays have had a longer period to get our funds deposited into their bank like say by Friday, September 24th when the Rays begin their final home stand with the Seattle Mariners in town. It would still give the team time to place their fingers on their keyboards and print and mail the post season ticket strips to their fan base, plus they could open the general public seating tickets on that Monday, 27th, still during the Rays final three game of their home schedule against the Baltimore Orioles. In order to purchase your postseason ticket packet, full payment must be received no later than Wednesday, September 8th,2010. After that time, the location of your invoice will no longer be available and the opportunity to purchase postseason ticket packages can no longer be guaranteed. Commemorative postseason ticket stock will not be available for accounts paid after the deadline. But on a happier note, I do have the dates of the postseason games in the American League and will post them below so we all can request the day off, or re-schedule that dentist appointment or whatever. Starting times will be announced at a future date. Game #2 will be held on Thursday, October 7th. The teams will have Friday, October 8th as a travel day to the opposing team’s city. Game #4 (If needed) will be played on Sunday, October 10th. If a fifth game is needed to finish the ALDS, The involved teams will have Monday, October 11th as a travel day. Game #5 will be held on Wednesday, October 12th,2010 to finish the series. Game #2 will be played on Saturday, October 16th. The teams will have Sunday, October 17th as a travel day between cities. If one team has not garnered a series advantage by this point, the teams will have Thursday, October 21st as a travel day. If the World Series is not decided by the October 31st date, the teams will again have Tuesday, November 2nd as a travel day back to the National League city. Game # 7 (If needed) will be held on Thursday, November 4th to determine the 2010 World Series Champion. Hope all this information is helpful to Rays fans who will want to also be included in the 2010 Rays playoff fun. Hope to see all of you at the ballpark, and look forward to cheering for our Rays this postseason. Oh what a difference a year can make. Less than a year ago we saw the Tampa Bay region go ballistic and creatively “on fire” with the possibilities of the Tampa Bay Rays. But just as quick, even the local poltical movers and shakers have forgotten the Rays like an old coat. And one local town Mayor even forgot where she lived for a moment and made an ill fated bet with another regional Mayor over the 2009 World Series. I have been holding onto my rambling thoughts about this past local event for quite some time. I really wanted the World Series to be over,and hoped that the St. Petersburg City elections might make me somehow forget all about this event. But it did not, and even now I am steaming under the collar that two local Mayors decided to place and wager bets on the outcome of the World Series. I am sorry Tampa Mayor Pam Iorio, but I am targeting you here. I understand your affection and pride in the pure fact that the New York Yankees principal owner has a home in your city. And I also understand your pride that several members of the Yankees also call Tampa their Winter residences. And I am well aware of expenses from the city coffers to make the lush and green surrounding of George Steinbrenner Field a true masterpiece. But don’t you think making a simple wager with the Mayor of Clearwater, who is a publicity mongler over the World Series might just anger local Tampa Bay Rays fans? How soon some people forget the turmoil this could cause because the Yankee fanbase that come into this region for their yearly series with the Rays already hold their numerous championships in their 100+ seasons as a team over our heads every chance they get. Now they can throw the pure fact that a local elected official doesn’t even have faith in the team. Do you think after your wager this is going to get any better since the Yankees did indeed came home with the title? Are you or your staff currently in the planning stages of a small parade here in the Spring to also honor them and further anger Rays fans? It might seem like a small almost invisible notion to your collective spin doctors and politcal advisers, but it is one Rays fans will not forget for a long, long time. And we know you have bigger fish to fry that just being the political guru of the second biggest Hispanic community in Florida. I understand that both Clearwater and Tampa are the Spring Training homes of both the Yankees and the Philadelphia Phillies. But they also are the seasonal homes to teams in the Florida State League teams of which your hometown Tampa Yankees played the Charlotte Stone Crabs for the league title earlier this season, and you did not make any wagers on that title series. Now I could see a small celebration for them, and maybe even the same wager, but then they are not the media darlings outside of their own region like the Phillies and Yankees right now. And that is where my biggest gripe come to a frothy head. You have a local team going for a possible championship, and even if it is only a Class-A franchise of the big club, you did not even acknowledge them during their triumphant playoff run and championship victory. That is the team you should have put your wagers on, the one that deserves the press and the acknowledement from the city of Tampa, and the ones their local fans come to see play during their short season. But to me,a Rays Season Ticketholder,that whole “wager” episode was a slap in my face. And maybe you are glad I am not a resident of Tampa, so I do not have a single voting option. But the political machine in this region has been preaching regional love and togetherness surrounding the Rays for years. But there have been obstacles in the way. Some say a small group of Tampa-based fans have a “bridge phobia” and that it is a fan base pocket in this area that is missing like a Bermuda Triangle in the middle of this Tampa Bay region. And they have missed out on a lot of great Rays baseball. Sure there are tons of Tampa-based Fans who brave the elements and the traffic to attend games, but to have one of their elected officials show more concern for a huge rival opponent of the Rays is a big slap in the face of the Rays Republic. Sure your seemingly innocent wager of proposing that if the Yankees were to lose this years World Series, You and your entire Tampa leadership team would attend a game at BrightHouse Field in the Spring of 2010 wearing Phillies gear and bring a pleathora of Cuban sandwiches and deviled crabs to the game for Clearwater Mayor Frank Hibbard and his staff to devour was a great gesture. And one that would have been met with no reprecussions at all if it was located far away from this Tampa Bay Rays fan umbrella. But it was done right within the heart of the franchises fanbase, and that is a shame. But you could have made the same local bet with the Port Charlotte or Punta Gorda Mayors over the FSL Championship and not caused even a ripple in the bay over the wager. Such a wager would have then been about civic pride and support for the Tampa Yankee squad as they played the Charlotte Stone Crabs. You were right out on the field there front and center with St. Petersburg’s Mayoir Rick Baker on Opening Day in 2009 saluting and praising the Rays. I know the Rays season did not turn out quite the way the fans and the community wished it had, but you did turn your back on this local MLB team for a moment, and with their biggest threat and divisional foe. This episode or misstep might not even cause any damper on your political aspirations to run for a future Senate slot, or even a higher post. Sure there are a lot of transplanted New Yorkers’ in this region who now have your name in their brains, and that might be a great political move for the future. But the native Floridians like myself like to usually live in the”Moment”, and in this case, you might have actually lost the bet. Sure the Yankees won the World Series,and Hibbard and his Clearwater crew will have to don pinstripes and serve you and your staff grouper sandwiches and conch fritters this spring, but did it come with a small price? I actually think you have a great abundance of “moxy” in you Madam Mayor, and I admire that trait in a politician. But what I can not honor and sit silently by is to see an elected officials proclaim a bet for a team that plays in the same division as her “so-called Favorite” Tampa Bay Rays. We all know politics can make for strange bedfellows, and I am not implying anything here, just stating fact. But in this bet you lost Madam Mayor. ou lost something I value more than a few sandwiches and shellfish appetizers. The thing you might have lost from some of your local fans, like me is respect. And that you can not get back with a zingy Mango salsa or a spicy Floridian seafood sauce. Enjoy the seafood Madam Mayor. I saw this photo today when I was going through all the fan photos on a certain newspapers site that can be purchased after the fact by customers. I think that we might have found ourselves a MLBlogger doing his thing during the 2008 World Series here. I remember him posting a blog about going to the World Series , with a sign and trying to get a World Series ball from one of the players. Well wouldn’t you know it, my Bullpen buddy Dan Wheeler would be the guy to finally send a ball up to him over the dugout. Well Zack, before today you probably did not even knoew that this picture existsed of you with Tampa Bay Rays gear on at the World Series. Well it does, and I am happy to post it here for the rest of the blogging communtiy to know that you always get what you come for. By the way, great sign, but the glove is the thing that get me laughing the most. If you can not get a ball with that glove, you are not trying hard enough. Well, dude, now you know that you are also famous down here in Tampa Bay. So we know now that Zack the Baseball Collector is more than an author and a avid baseball fan. He is now ingrained into the Tampa Bay Rays psyche since this photo was taken by the St Petersburg Times during Game 4 of the 2008 World Series in Philadelphia. Further proof that he will go to any length to fulfill his destiny as the man………………..even in an enemy town. I guess that is why we love to read and laugh with him and all his wild adventures. Photo credits for this blog go to: www.snaggingbaseball.mlblogs.com, www.tbo.com. I remember a few New Years Eve celebration in Philly in the mid 80’s where the city used to go nuts and celebrate their hearts out. Nothing was too wild or too crazy, but you always had a few people in the crowd who went against the grain and made a great situation worse by either fighting or detroying something. World Series celebrations are famous for fires and overturned cars. Sometimes they even get into the looting and the shop window replacement business during the night. I was browsing the online editions of the local Philly newspapers and found out some of the statistics of last night’s wild activities. Unfortunately in St. Petersburg, we could never have this kind of thing happen close to the stadium. Considering the main party place, Ferg’s is directly in front of the St. Petersburg Police station, it would be hard to have this kind of activity go on without major consequences. But, you never know what some people will do in the name of fun. Philadelphia Phillies fans celebrated the World Series victory well into the early morning hours and there was plenty of evidence of the party — and destruction – up and down Broad Street on Thursday morning. Police Commissioner Charles H. Ramsey said police made 76 arrests overnight during the disturbances Additional details were expected to be released on Thursday. “I wouldn’t say the city got a black eye, but it was a little bruised,” he said in an interview this morning. Arrests during last night’s “revelry” included: Robberies: 1; Assault on police: 12; Arson: 1; Theft: 3; Vandalism: 17; Obstruction of justice: 1; Trespassing: 5; Disorderly conducts: 36. Police said the majority of those charged were college students. No homicides were reported overnight. The emergency room was busier than usual last night at the University of Pennsylvania Hospital. Hahnemann typically has zero to three trauma cases on a Wednesday night, but last night had 11. Robinson Luggage on South Broad Street – struck especially hard by hooligan revelers last night — reopened this morning at 10 a.m., though windows remained smashed and the the doors boarded up. Owner Sharon Laudenbach said the shop had been hit by looters and hundreds of upscale bags had been stolen. The city streets department this morning would only say cleanup crews were out working all over the city. At Citizens Bank Park there were no signs of Wednesday night’s revelry — outside of the manure left by the horses from the Pennsylvania State Police mounted patrols. Fox29 was hosted its morning show at the third base gate. The glass windows and doors of Robinson Luggage were smashed. Oversized planters were overturned and their contents spilled out onto the street. Closer to City Hall, at Broad and Chestnut Streets, a newspaper honor box remained planted in the window of the FYE film and music store. Two of the oversized FYE plate glass windows were shattered. Outside the Prince Music Theater, the 8-foot high sculpture was listing at a 45-degree angle. At the Modell’s at 1528 Chestnut Street, 50 fans had lined up by 4:30 a.m. to buy World Series commemorative t-shirts, caps, jackets. Though the store wasnt’t scheduled to open until 5 a.m. Mitchell Modell, the owner and CEO of the chain, opened the doors and let them in early. Here is another wild story bases out of Philly. I included this story because of the wild end to this caper. You would think if you pulled off a crime in a city you would not go to an area where you might be recognized almost immediately by police. But to the credit of the theft, at least he had the good sense of what was right and wrong at the time and spent his money wisely. Maybe he was trying to buy World Series tickets and could not meet the Stubhub prices? Phillies fans are known for their diehard, drastic and often drunken support for their team. Crazed Phanatics paint the team’s logo on their lawns or imbibe the same amount of shots as the number on favorite player’s jersey. It doesn’t matter. You take one for the team. But one fan may have taken his devotion a bit too far when police say he robbed a bank and later allegedly funded a shopping spree for Phillies gear with the stolen cash. About 10 a.m. Wednesday, a man, who police did not identify, entered a PNC Bank on Welsh Road near Roosevelt Boulevard and slipped the teller a demand note. Shortly after, the man, wearing a red and gray hat pulled down over his face and a beige hoodie, fled westbound on Welsh with an undisclosed amount of cash, said a detective from Northeast Detectives. About 20 minutes later, cops found the suspect, who police have not identified, a few miles away coming out of the Modell’s Sporting Goods store at the Roosevelt Mall, Cottman and Bustleton avenues. Police did not confirm whether the man was wearing Phillies gear or not. But authorities said they later recovered the rest of the cash in a nearby trash bin. Witnesses positively identified the suspect and police carted the robber off, assuring that the ardent fan would miss watching the Phillies duke it out against the Tampa Bay Rays in the conclusionof Game 5. He might miss the game, but at least he won’t face federal charges, said Jerri Williams, the Philly FBI spokeswoman. Local authorities charged him with robbery, theft and related offenses. Guess he is kicking himself now by going to Modell’s. He could have hid out for the day and been a rich guy buying tons of World Series collectibles on Thursday morning, instead of sitting in a cold jail cell waiting to see the judge. I was told that J P Howell was taking the loss pretty hard last night after the Philadelphia Phillies ended the 46 hour lay-over of Game 5 of the World Series. I do not know why he is thinking it is the end of all things right now. You have to remember that this years’ team went above every expectation set by the coaches’ and management. they flew beyond any goal or lofty intention of every and any fan, and last, but not least, they made us proud to be Ray Fans. I did not go out to the Trop last night at 3 a.m., I wanted to cheer and applaud for the Rays for a job well done. But this is private time. I know as an ex-athlete that you need a little space right after a collossial event to get your feet back on the ground. It has been an emotional rollercoaster for the team the last 3 days. And no matter what the outcome, there was going to be some backlash mentally and emotionally. Just remember guys, on Saturday at the City of St. Pete celebration, it will all seem to fade away. We have 107 days until we start it all over again, and I can not wait personally. Not for the goals and aspirations of 2009, but because the Rays deserve another shot at the title. If Rocco can come back off the canvas, why can’t we get another shot at the ring and the dream. Seriously, it was a great World Series from Game 1-5. The Phillies have been hungry for a title for 28 years in baseball. Heck, Pete Rose was playing third base back then for the Fightin’ Phillies. What was so special was to see 40-something Jamie Moyer go out to the pitching mound and take a pole and wedge that pitching rubber out of the clay and take it home. It was an exciting series. And do I enjoy the end result………well, no, but I do enjoy the fact that it was settled on the field and not in a boardroom or in a conference call. We got to finish the game, and for that we have to thank Baseball Commissioner Bud Selig. He wanted to play these games to their conclusions. He did not want a shortened World Series, or a series that would be questioned. He might still be questioned, but I think it was done with the most respect for both teams and was done as fast and as safe as possible. Game 5 had to be stopped, and the Rays scoring in the top of the 6th inning on Monday gave him ample cause to suspend it and play it under better circumstances. There were an announced crowd of 44,000 on hand Wed. night. That is about 1,000 less than Monday, but those people might have already been on Broad Street preping for a good time by 8:30 that night. We played out the final 2 1/2 innings and the city got to have a dry and cool celebration after all. The Rays Bullpen has been a mainstay of this team for so long this season it amazes me that they are taking this loss so personally. If not for the efforts of everyone down there, especially Grant Balfour and J P Howell, we might not have even hit the playoffs at all this season. 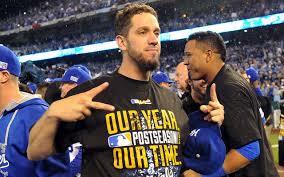 If you are looking for true MVP’s of this playoff run, you have to consider the entire Bullpen as a whole. They have gone above and beyond themselves all year long, and do not have anything to be ashamed of at all. Grant Balfour went to the mound in the bottom of the 6th and Phillies Manager Charlie Manuel sent up Geoff Jenkins to pinch-hit for Cole Hamels, who was still the pitcher of record for the Phillies. Jenkins had played with Balfour with the Milwaukee Brewers’ and probably knows his pitching style better than anyone else on the bench. On a 2-2 count, Jenkins hit a long fly ball into the right-center gap that hit off the scoreboard just out of the reach of a sprawling Rocco Baldelli. The ball fell to the turf and B J Upton went and retrived the ball to keep Jenkins to a double. With Jenkins in scoring position, Jimmy Rollins came up and put doen a sacrifice bunt to move Jenkins less than 90 feet from giving the Phillies the lead in the game. Jayson Werth then came up and hit a shallow looper to the spot between second base and the outfield. Akinora Iwamura went out to try and pull in the ball, but after trying to catch it via a basket-catch, the ball trickled down from his glove to the turf and Jenkins scored to give the Phillies the lead 3-2. That was the end of the night for Balfour, who went 1.1 innings total in the game, but went 1/3 of an inning tonight, giving up 2-hits and a lone run. J P Howell then came on to face Chase Utley and got him to strikeout on 3 pitches. Ryan Howard then came to bat and hit a fly ball to Evan Longoria at third for the final out of the 6th inning. In the 7th inning, Pat Burrell came up to start the 7th inning and was hit-less in this years’ World Series. He was currently 0-13, when he hit hanging curveball into the left-center section of the outfield and clipped the high wall to settle for a double. Burrell was immediately replaced by pinch-runner Eric Bruntlett at second base. That ended the night for Howell as he went 2/3rds of an inning throwing 7 pitches and giving up 1-hit and 1-run for the Rays. Chad Bradford came on and quickly got Shane Victorino to ground out to Iwamura at second base. This moved Bruntlett to third with 1-out in the inning. Pedro Feliz then hit a ball up the middle for a RBI single and the Phillies were up 4-3 at that time. Bradford got Carlos Ruiz to hit into a 4-6 force out at second, with Ruiz on first on a fielder’s choice. Iwamura made an amazing play behind second base to get the force out on Feliz. Phillies reliever J C Romero the came up and hit a ball to Iwamura that he flipped to Bartlett at second base for another force out to end the inning. David Price then came on in the 8th inning and got a quick fly out from Rollins and a strikeout of Werth. He then gave up a walk to Utley before getting Howard to strikeout to end the inning for the Phillies. In the 7th inning, with Ryan Madson on the mound for the Phillies, Dioner Navarro struck out to lead off the inning. Then rocco Baldelli came up and on the first pitch took Madson deep to leftfield on a line drive homer to tie the game at 4-all. The Blast was just the first homer of the World Series for Baldelli, but it put life back into the Rays’ hopes for a Game 6 at Tropicana Field on Thursday night. You have to be pleased with the effort of Jason Bartlett at shortstop for the Rays this season. He has brought a solid defense and a secure bat to the lineup that the Rays have never had at the position. In the top of the 7th inning tonight, Bartlett hit a single to leftfield to try to keep the rally going after Baldelli’s homer. J P Howell came up and batted in the inning for the Rays. This was an unsusual play as Rays Manager Joe Maddon could have used a pich hitter to hit for Howell since he had David Price and Chad Bradford warmed up in the Bullpen. But Maddon let Howell take his whacks at the plate for the Rays. Howell put down a perfect sacrifice bunt to move Bartlett to second and into scoring position for the Rays. Iwamura then came up and hit a infield single to shallow centerfield and Bartlett was rounding third when Utley faked the throw to first and threw to home to get the streaking Bartlett by less than a foot at the plate. Bartlett was tagged out as he was stretching his hand for the plate and it ended the 7th inning for the Rays. It was a gutsy play by the Rays shortstop, and one that almost made a huge difference in the contest. You have to credit Utley for seeing Bartlett taking a wide turn at third and streaking for home. If Utley has held onto the ball a split second longer, Bartlett would have scored and tied tha game at 4-all for the Rays. 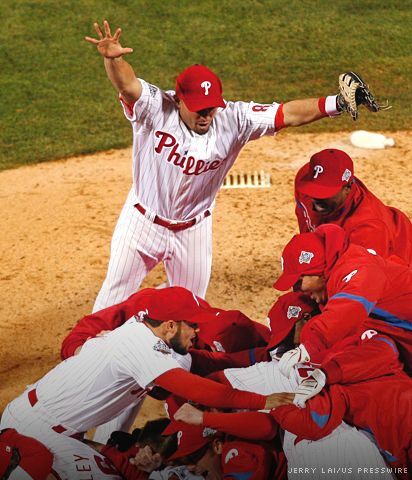 So if you have to find a defining moment in this game……..this was the series clincher fo the Phillies…. at the plate. The Rays did try amd mount another rally in the 8th inning after Carl crawford lead-off with a single to centerfield. B J Upton hit a ball to short that Rollins turned into a 6-4-3 double play to remove the Rays threat in the inning. Pena then hit a weak fly ball to left to end the inning for the Rays. In the 9th, Evan Longoria lead off the inning by hitting a fly out to second base. Navarro then hit a shattered bat single to right that fell in front of a hard charging Werth. Maddon then sent in Fernando Perez as a pinch-runner for Navarro. With pinch-hitter Ben Zobrist at the plate for the Rays, Perez stole second base on the third pitch to Zobrist and put a runner in scoring position for the Rays. Zobrist then hit a shot to right that was caught by Werth for the 2nd out of the inning. With 1-out left in the Rays season, Maddon sent up Eric Hinske to pinch-hit for Bartlett. Hinske went down on three pitches to give the Phillies their first championship since 1980 in the majors. The Rays were scheduled to be flying into St. Petersburg-Clearwater Airport at 3 am on Thursday. The team did not have a planned greeting at the airport and the team was to quickly get on their coaches’ for the trip to the Trop. Several people were at the airport waiting for the team, but they did not come through the baggage area and loaded straight from the plane on the tarmac. The Rays then trekked from the airport to the back enterance at the Trop. There they were greeted by a few dozen fans who stood out in the cold to cheer for the hometown Rays. Several members of the team did come out and salute the crowd before heading into the Trop to pack and have some private time with team mates and family. I will be getting the information on the City of St. Petersburg celebration sometime today or tomorrow. Stay tuned to your favorite Rays blog and I will be sure to pass on all the info I get as soon as I recieve it. Again, remember that this team exceeded all expectations of it during the season and should be roundly applauded for their hustle and determination to even get into the playoffs this season. The Saturday event will be to celebrate not only the team;s efforts, but the increased support and bonding of the Tampa Bay area this season behind the Rays “Magical Summer Tour 2008”. The region has grown from just a spotty support group for the team, to an increasing fan base throughout the country and the world. The Rays are no longer the loveable losers of yesteryear. We now have tasted the fruits of winning, and it is sweet to our mouths, and we yearn for more………. Pitchers’ and Catchers’ Report in 107 DAYS. The Rays are staying at a posh, very romantic resort in Wilmington, Delaware right now, and it is the perfect place for them to relax and recharge before taking on the Philadelphia Phillies tonight and hopefully, extend this series to at least 1 more game……….or more. The Rays have been in this situation before, and it is nothing usual to them. All year long they have been hearing the whispers and the chuckles from beyond their ears about their abilities and their chances. It is time for them to …..as eloguently put in the movie, The Program: ” It is time to put the women and children to bed and go searching for dinner.” It is the bottom of the 6th, no out, and the world is waiting to see what they are made of tonight. to say it is “put up or shut up” time is an understatement. They came into the Wrold Series as a favorite for only the first time this postseason, and it isa a role they havew not had to play in 2008. I thought the Renaissance Vinoy was a beautiful hotel to stay in for baseball games, but the Hotel du Pont was the brainchild of millionaire mogul Pierre du Pont, and shows all his tastes for the finer htings in life, as well as the best that the European hotels had to offer in the early 1900’s. The hotel opened on January 15, 1913 and has over 295 registered guest that day. During the opening week, over 25,00 people strolled the gardens and ballrooms of the 5-star hotel. No expense was spared by Du Pont is creating Wilmington’s crowned jewel. Throughout the years the hotel has evolved with the times. wooden inlaid floors became marble, mirrored walls replaced with traverstine stone, and the ceilings were carved with scrolls and rosettes. It is a hotel that money could not build today for less than a billion dollars. It is the lap of luxury in America’s first state. But I have to say, no matter what the cost ( $ 299. / night ), it is not too much for our traveling Rays. I know when I travel to the other cities in the leagues for games I try and stay at a local landmark hotel or historical registry member that will boost my conversation when I am out and about in that town. This setting will be the talk of the clubhouse for a long, long time. It has to be one of the best finds by Jeff Ziegler in his career as the Rays Traveling Secretary, and it was by accident that he found this gem. Because the team checked out of the Westin in Philly fully expecting on Monday night to be jetting back to the warmth of home, the team did not make emergency lodging preparations before the games suspension. Ziegler had to find 80 plus rooms on a moments notice and not only found them in accordance with the Players’ Union specs of a high end lodging, he found one in a romantic section southeast of Philadelphia. If there was an award for on your feet, quick thinking under fire, Ziggy would get it hands down from the Rays for his hotel magic……….and to think 12 years ago he was a police officer with the St. Petersburg Police Department and we did not have the Rays. Scott Kazmir walked 6 batters in only 4 innings on Monday, making him only the 3rd pitcher to walk that many batters in that few innings in a World Series game. The Brooklyn Dodgers’ Rex Barney walked 6 Yankees batters in 2 2/3 innings in 1949 and the Tigers’ “Wild Bill” Donovan lived up to his moniker by walking 6 Pirates batters in 3 innings in 1909. B.J. Upton stole his 4th base of the World Series in the top of the 6th, and it turned out to be a crucial move, as he scored the tying run on Carlos Pena’s RBI single. Upton’s 4 steals are the most by a player in one World Series since Omar Vizquel had 5 in 1997. Umpires come clean on two key calls in the World Series. The Philadelphia Phillies scored in the first inning of Game 4 on Sunday night after Jimmy Rollins scampered safely back to third during a rundown. But television replays showed he was tagged on the backside by Tampa Bay’s Evan Longoria and should have been called out by 3rd base umpire Tim Welke. Rollins wound up scoring when Pat Burrell drew a bases-loaded walk from Andy Sonnanstine, and the Phillies went on to a 10-2 victory that gave them a 3-1 lead in the best-of-seven Series. It was the Rays who got a break in Game 3, when speedy Carl Crawford was called safe by 1st base umpire Tom Hallion on a 7th-inning bunt single. Replays showed Jamie Moyer’s glove flip to first baseman Ryan Howard beat Crawford on a close play. “Bang-bang play, and I tried to get the best angle on it,” Hallion told a pool reporter. “I really didn’t get a sound to be able to judge. It winds up being a great play. And looking at a replay here, they just got him.” Crawford scored as part of a 2-run rally and Tampa Bay tied it later, but Philadelphia won, 5-4. There were a couple of disputed calls during the first 3 games at Tampa Bay, too. Maddon screamed for a balk on Cole Hamels when he picked off a Carlos Pena in the opener, and Rocco Baldelli drew a key walk on a checked swing in Game 2 that the Phillies thought had been called strike three. And then there is the strike zone. Fox and its announcing team of Joe Buck and Tim McCarver have also pointed out several inconsistencies throughout the series. Moyer seemed to benefit from Fieldin Culbreth’s calls behind the plate in Game 3, when Fox’s tracking system registered several pitches out of the strike zone that went in the Phillies’ favor. In Game 5, the tracking system showed that Rays starter Scott Kazmir received at least three ball calls from Jeff Kellogg that looked to be strikes. Two to Pat Burrell, with 2 strikes, in the fifth inning led to Kazmir’s 6th walk, and he was pulled thereafter. In the previous inning, the Rays’ Akinori Iwamura struck out on a pitch that appeared several inches out of the strike zone. This is the first postseason in which baseball is using replay–though only to review home run calls. Welcome to uncharted waters. We’re moving forward, but it’s definitely still very murky. But to the people in Florida, murjy is not always a bad thing. You know we do have swamps and bogs and underwater caves to explore in this state. With the first suspended game in World Series history now scheduled to resume on Wednesday. Major League Baseball officials ruled that Tuesday was out of the question after logistics and the current weather was put to senarios and complications of playing in the weather. Manager Charlie Manuel confirmed what was already a formality on Tuesday. But Hamels would be in line for his fifth victory of the postseason if the Phillies could push across a run in the 6th and hold on to the lead for a win. Hamels would be the first starter in postseason history to win five games in five starts. Rays manager Joe Maddon said on Monday night that Grant Balfour, who pitched the fifth for Tampa Bay after starter Scott Kazmir was pulled, is his pitcher to start the sixth. But there’s an excellent chance that will change quickly. Most of Philadelphia’s dangerous pinch-hitters bat from the left side, most notably Matt Stairs. So Manuel likely will summon a lefty as his first hitter once the game resumes, and Maddon likely would counter with a southpaw on the mound. In fact, Maddon would be wise to warm up a lefty at the same time Balfour warms up. I am guessing that Rookie phenom, David Price will be warmed and ready to go by game time if Maddon inserted him into a long reliever’s role to take over the lasdt 3 innings of the game for the Rays. Both teams have well stocked Bullpens that will have plenty of rest. No pinch-hitters have been used, and the switch from Kazmir to Balfour is the only pitching change. So both managers have a full complement of tactical options once the game gets back under way. Both, meanwhile, downplayed the possibility of using a starting pitcher as a reliever in Game 5. So in the practical sense, there’s no real advantage going forward. Yet Tampa Bay has to feel on some level that it has pulled something of an escape. The Rays outlasted Hamels, and they’re not behind. They may have the starting pitching advantage in Games 6 and 7, should those occur, and they’d also have home field. That starting advantage in a potential Game 7, however, could go completely out the window if baseball adds a travel day after Game 5. The possibility is still in play that following a game Wednesday, the teams would travel on Thursday and play Game 6 in St. Petersburg on Friday. That would put Game 7 on Saturday, which would allow Hamels to pitch on full rest. Additionally, the dynamics of Games 6 and 7 change in other ways. If Game 6 is held until Friday, then every starter on both teams save Hamels and Kazmir would be available to pitch on full rest in that game. Game 4 took place on Sunday, so a Game 6 on Friday would provide four full days of rest for Joe Blanton and Andy Sonnanstine. At the very least, Blanton and Sonnanstine would be available to pitch in relief as much as needed in that game. Both of these bullpens are excellent, though Philadelphia has at least one advantage in that it needs 3 fewer outs. The Phils also have all of their end-of-game options intact, while the Rays do not have a shut-down closer this postseason. It all starts with the Rays and Phillies getting through Game 5. That could be Wednesday — or later. It could start with Chris Coste against Balfour, and it could start with Stairs facing David Price .Whatever the course, each team will steer itself towards a clear and presnet advantage. If the Phillies find that safe portage, the series is over and the celebration will start on Broad Street immediately. And if the Rays can pull off another miracle, we get to go to a closed dome stadium where weather and the elements are not a concern once you head into the doors of the Trop. So we get a night to relax, recharge and rejoice th fact that the World Series will take a few more days to complete, but then again………..Febuary is coming fast. The following passages are taken directly from the Major League Baseball Handbook distributed to all members of the MLB and it’s clubs. I got a copy of this manaul this year from someone within the Rays organization, and it is pretty informative if you ever get a chance to read it. It might not great bedtime reading, but if you have a lazy day and just want to learn something trivial and might be useful one other time in your life…………this is the book. (6) It is a regulation game that is called with the score tied. (7) The game has not become a regulation game (4½ innings with the home team ahead, or 5 innings with the visiting club ahead or tied). (8) If a game is suspended before it becomes a regulation game, and is continued prior to another regularly scheduled game, the regularly scheduled game will be limited to seven innings. (9) If a game is suspended after it is a regulation game, and is continued prior to another regularly scheduled game, the regularly scheduled game will be a nine inning game. EXCEPTION: Optional Rules 4.12(a)(7), 4.12(a)(8) and 4.12(a)(9) for National Association Leagues will not apply to the last scheduled game between the two teams during the championship season or league playoffs. No game called because of a curfew (Rule 4.12(a)(1)), weather (Rule 4.12(a)(5)), a time limit (Rule 4.12(a)(2)) or with a tied score (Rule 4.12(a)(6)) shall be a suspended game unless it has progressed far enough to have been a regulation game pursuant to Rule 4.10(c). A game called pursuant to Rules 4.12(a)(3) or 4.12(a)(4) shall be a suspended game at any time after it starts. NOTE: Weather and similar conditions–Rules 4.12(a)(1) through 4.12(a)(5)–shall take precedence in determining whether a called game shall be a suspended game. If a game is halted by weather, and subsequent light failure or an intervening curfew or time limit prevents its resumption, the game shall not be a suspended game. If a game is halted by light failure, and weather or field conditions prevent its resumption, the game shall not be a suspended game. A game can only be considered a suspended game if stopped for any of the six reasons specified in Rule 4.12(a). (ii) Immediately preceding the next scheduled doubleheader, if no single game remains on the schedule. (iii) has not progressed far enough to become a regulation game, the game shall be declared “No Game.” In such case, the game is to be replayed in its entirety, unless the league president determines that playing the rescheduled game is not necessary to affect the league championship. A suspended game shall be resumed at the exact point of suspension of the original game. The completion of a suspended game is a continuation of the original game. The lineup and batting order of both teams shall be exactly the same as the lineup and batting order at the moment of suspension, subject to the rules governing substitution. Any player may be replaced by a player who had not been in the game prior to the suspension. No player removed before the suspension may be returned to the lineup. A player who was not with the club when the game was suspended may be used as a substitute, even if he has taken the place of a player no longer with the club who would not have been eligible because he had been removed from the lineup before the game was suspended. Rule 4.12(c) Comment: If immediately prior to the call of a suspended game, a substitute pitcher has been announced but has not retired the side or pitched until the batter becomes a base runner, such pitcher, when the suspended game is later resumed may, but is not required to start the resumed portion of the game. However, if he does not start he will be considered as having been substituted for and may not be used in that game. (d) Rain checks will not be honored for any regulation or suspended game that has progressed to or beyond a point of play described in Rule 4.10(c).